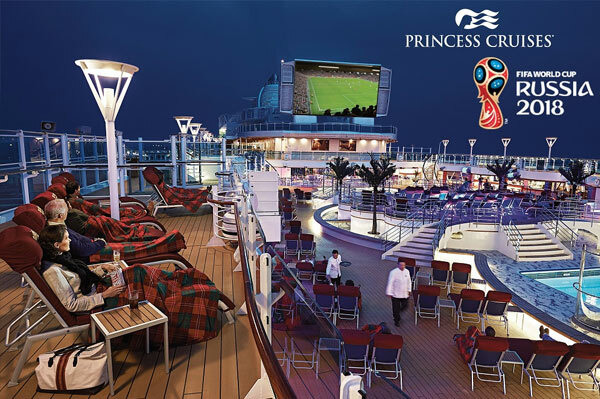 Princess Cruises guests sailing all over the world will be able to watch and cheer on their favourite team during the upcoming 2018 FIFA World Cup Russia. Broadcasting all 64 soccer games aboard nine cruise ships, the matches start June 14, culminating with the final in Moscow on July 15. Games will air on the cruise line’s signature Movies Under the Stars outdoor screens, which have space for hundreds of guests to catch the action. 2018 FIFA World Cup games will be shown aboard: Sea Princess (World Cruise), Crown Princess (Mediterranean), Diamond Princess (Japan), Emerald Princess (Alaska), Majestic Princess (Taiwan and China), Pacific Princess (Northern Europe), Regal Princess (Scandinavia and Russia), Royal Princess (British Isles) and Sapphire Princess (Northern Europe). Soccer fans can also enjoy themed entertainment and activities, including interactive game play with PlayStation units on Movies Under the Stars, obstacle course competitions and penalty shoot outs for prizes.